Westcliff Hard offers a full range of coaching options for adults and children. Prices for coaching are very reasonable. Go straight to the price list. Graham is our Head Pro. He is a fully licensed LTA coach with a proven track record in developing budding young tennis players. He has coached at the club for 31 years and produced more Essex junior champions than any other coach in Essex. Many of his players have gone on to LTA performance centres and Spanish academies. Graham Broadley, our Head Coach, is a fully licensed LTA coach.Contact him at [email protected] or on 01702 465118. A team of qualified coaches works alongside Graham to provide a full range of coaching services. Tracy Chesher and Jo Edwards work in the mini tennis section and develop children up to the age of 9 years. Paul Clark the the club’s ATC (Assistant Tennis Coach) and provides one-to-one tuition for children aged 5 to 9 years old. Mini tennis is for children aged 5 to 10 years old and is the very foundation of our junior programme. Mini tennis is played on scaled down courts and has three stages of progression: mini red, mini orange and mini green. Mini red is for children aged 5 to 8 years old, mini orange is for children aged 9, and mini green is for children aged 10. Each stage has its own court size and type of ball. 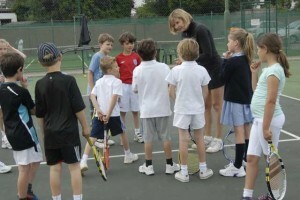 We have a large mini tennis coaching programme that involves both group and individual coaching. The majority of our junior membership has group coaching. Children aged 11 and over move on from mini tennis balls to the standard yellow balls and train on a full-sized court. Group coaching is popular with children because they both learn and meet friends at the same time. When a child takes up the game for the first time, the best way to start is in a group with players of similar standard. Pay and play takes place on Saturdays from 9:00-10:00am is for children aged 8 to 10 and. The cost is £3.00. Children can come to six sessions without to being a member, giving them the chance to try tennis before taking the plunge and joining. Junior Morning is for children aged 11 upwards and involves the use of standard tennis balls (yellow ball) and a full sized court. Children are supervised in to games compatible with others their standard. Singles and doubles games are organised, and impromptu tournaments are held if numbers are right. Junior morning is run by the Head Pro and is free to attend. Sue Bunting opens the canteen and tuck shop (school term times only) and serves bacon rolls, teas and coffees. Junior morning has s a great sense of community and is an integral part junior life at the club. We recommend juniors of all standards attend. Tennis is for everyone. It doesn’t matter how old you are or what your status in life is, tennis can be learnt and enjoyed. We have a range of coaching options for adults to get started. Rusty Rackets & Newbies is a great way to take the game up or return to it after time away. It’s also excellent value and no other club offers anything quite like it. Click here to find out how it works. Coffee Morning tennis is on Mondays 9.30-11:00am and consists of organised doubles, drills and impromptu tournaments. Players need to be of intermediate standard or above to take part. Each session costs £5 to attend. Players can just “drop in” so no need to book. A good way for adults to take up the game is to start with a group of friends and form a small squad. Squads can consist of between four and eight players with the cost split between however many attend. For the most rapid progress possible, one-to-one lessons are the best solution. You get expert advice and repetitive practice all to yourself. But another great option is to share lessons with a friend. So long as both players are compatible it’s an option that works well – plus it splits the cost. Graham Broadley, our Head Coach, is a fully licensed LTA coach. Contact him at: [email protected] or on 01702 465118. A team of other qualified coaches works alongside Graham and they provide a full range of the experience needed to cover the different aspects of the teaching skills required. Graham Broadley 31 years HEAD COACH ICA & Fully Licensed DBS, 1st Aid, Safeguarding, & Basic Ref. SATURDAY Rusty Rackets & Newbies 6:00-7:30pm March to Nov Beginner & Intermediate £40 for six sessions. Click for details.